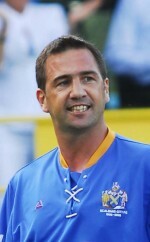 Is in his second season as St Albans City’s assistant manager and is also likely to be a member of the side. A coach at the local football development college who began a lengthy Football League career on the books of Manchester City. After leaving Maine Road he played for Mansfield Town, Rushden & Diamonds, Leyton Orient and Cambridge United. Joined City from Kings Lynn where he was Player of the Year in 2008-09.